Remodelled in the 19th century, the Palazzo Salimbeni’s neogothic façade. 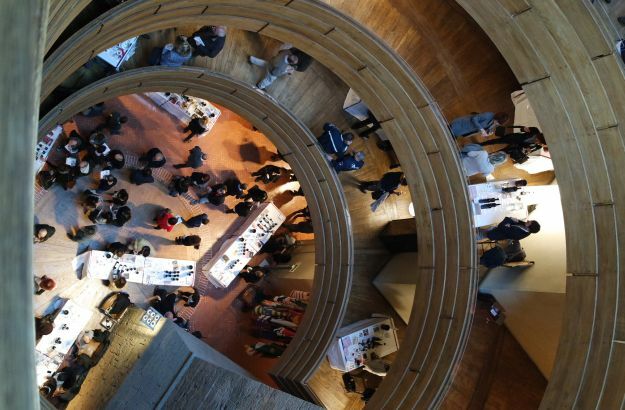 The Wine & Siena Fair showcases the best of Tuscany’s wine production. 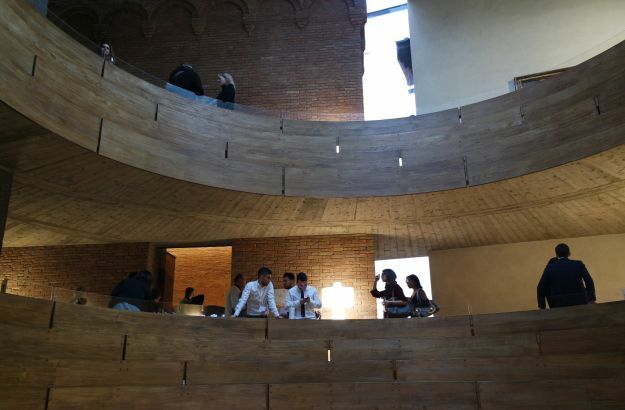 A large round staircase spirals up in the heart of the bank’s precincts. 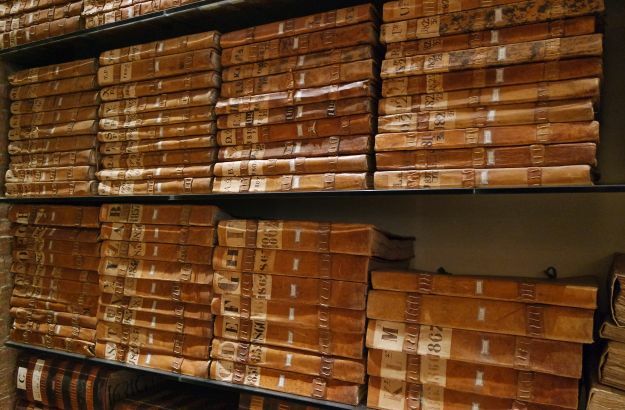 The Palazzo Salimbeni is home to a large collection of old account books. 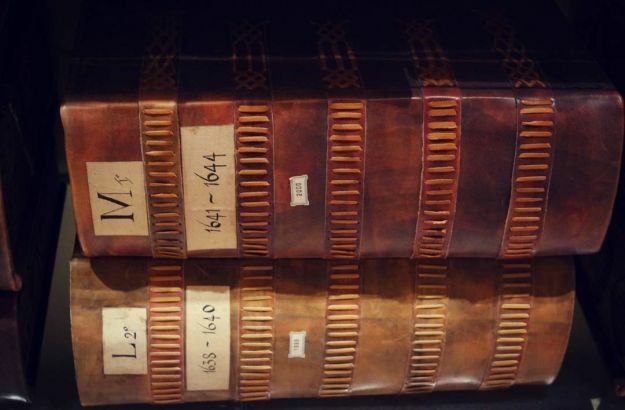 Look a little closer at the dates on these books… 1638-1640, 1641-1643 ! 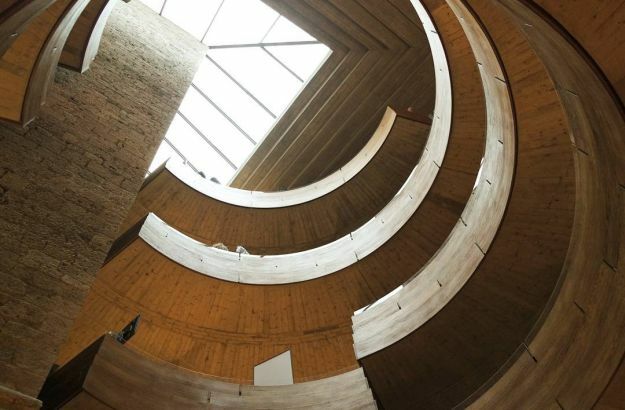 This large spiral staircase was designed by Pierluigi Spadolini in 1969. A glass of wine in hand, I walked up the stairs and reached Heaven! Yes, Siena, you’ve guessed right. Well, have you? 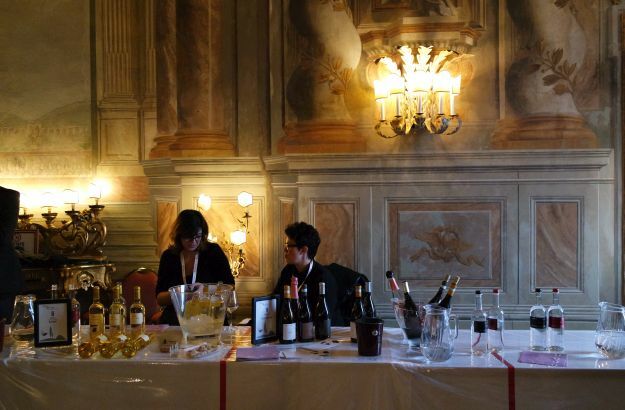 Something new has recently been added to Siena’s impressive catalogue of treasures: the Wine & Siena annual fair, which brings into the limelight many of Tuscany’s best wines. The second edition of this event was held in January in two different venues: the Grand Continental Hotel and the beautiful Palazzo Salimbeni, an architectural gem located on the Piazza Salimbeni. 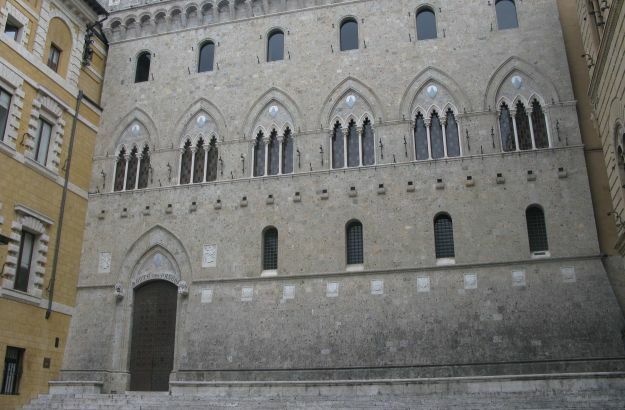 The Palazzo Salimbeni is home to the headquarters of the BMPS, the Banca Monte dei Paschi di Siena, the oldest surviving bank in the world – founded in 1472! – and currently Italy’s third largest bank. Normally off-limits to visitors, the Palazzo is opening its doors to the general public on the occasion of the Wine & Siena Fair. I seldom say no to a good winetasting event; and when it is held in such beautiful premises, I never let slip the opportunity. Remodelled in neogothic style in the 19th century, most probably on top of pre-existing medieval structures, the building hides behind its majestic façade impressive frescoed ceilings and a large collection of archived account books dating back several centuries. To my astonishment, I also discovered during my visit that the Palazzo is also home to a most wonderful spiral staircase which was designed in 1969 by architect Pierluigi Spadolini, and completed in 1978. A glass of Tuscan red wine in hand, I undertook to climb step by step this stately and towering stairway to Heaven… A moment of sheer bliss! The next edition of this new Wine & Siena Fair will be held in January 2017. Here is the link to their website: Wine & Siena.